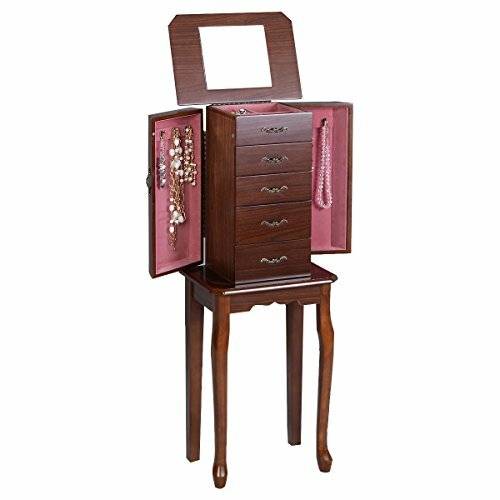 This is our newly designed Jewelry Cabinet with mirror on top which serves as aperfect example for large storage capacity and high quality. The 5center drawers save u a large space for your favorite accessories such asbracelets, glasses, ties, scarves, watches, perfumes while the interior hookson the side doors prevent your necklaces and chains from tangling and fold into form a sleek, uniform front. And the traditional turnedpost legs make this jewelry armoire timeless and elegant. If you are lookingfor a jewelry cabinet, don't hesitate to buy it! 【Good Storage Capacity】 The 5 center drawers save u a large space for your favorite accessories such as bracelets, glasses, ties, scarves, watches, perfumes while the interior hooks on the side doors prevent your necklaces and chains from tangling and fold in to form a sleek, uniform front. 【Ergonomic Design】The height of the jewelry cabinet is ergonomics. It is close to the height of people sitting on the chair and you do not need to bend your knees, or stand up to take out your jewelry. You could just use it conveniently while you sitting on the chair or stool. 【Perfect Detail Workmanship】There is a mirror under the top lid, you could open it when you want to use it. High quality connecting procedure which could make this cage more durable and solid. The legs of this item is stable wood which makes this cabinet more reliable. 【Solid Structure】This cabinet is made by MDF and structured with heavy-duty material for extended durability, and the structure follows the scientific principle and is strong enough to hold various things. It's sturdy and solid for long time and durable usage. 【Easy to Assemble】This product has straight forward illustrations and descriptions. Every screw and pin has its own code and it's easy to understand the assemble progress. It won't take you much time and could save your energy.